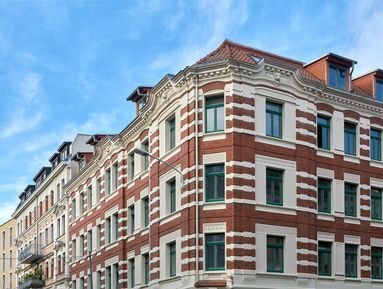 A beautiful apartment, in a superbly-renovated building, in Leipzig’s most popular neighbourhood. It doesn’t get much better than this. And with three good-sized rooms looking out onto the quiet side street, this first-floor apartment uses its 88sqm well. All three rooms are well-proportioned and are reached from the central hallway, which offers room for storage. The kitchen is large enough for a dining table and opens onto a pretty balcony facing into the quiet courtyard.